Secret Story Behind the Birth of the LE POUSSE-POUSSE! 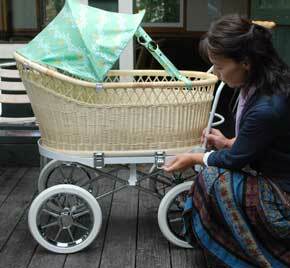 Akiko, why was it that you decided to develop a baby carriage? 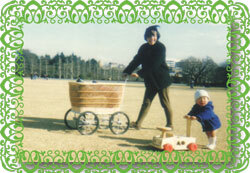 When I was around five months pregnant, I saw a baby carriage on display at a variety store in the Printemps Ginza. It was a big carriage with a rattan basket. More than its utility, I was impressed with its shape. It was just fantastic. Did you purchase the baby carriage? I couldn’t get it because it was part of a display, so I looked all over for the same model. Finally I got it and started to use it as a crib at home. I tried all kinds of things, like decorating the basket with a wreath around Christmas time. "People often asked to take pictures of me and my baby carriage. I really enjoyed walking around." What did you feel when you went out with that baby carriage for the first time? First I thought I’d give it a try, but once I went out with it, I found myself having fun. My baby carriage attracted a lot of attention. I went to Shinjuku Gyoen almost every day, and people walking there remembered us. I made a lot of friends there. It sounds like you went out for a lot of walks. Yes, I did. People say it’s not good for just you and your baby to stay home all the time, after all. Since I enjoyed walking with my favorite baby carriage, I spent a lot of time outside with my son. Since baby carriages are a bit rare, a woman called out to me from a 2nd floor window, "Your baby carriage is adorable!" When did you start thinking about making an original baby carriage? And then you decided to make the main body as well? So you developed it based on experience? Right. I asked my husband for whatever I thought necessary. I asked to make it lighter and easier to handle, or to add a safety stopper, or to add shock absorbers for bumpy streets and such. Plus, when my son was around one year old, there was one time he stood up in the baby carriage and fell out of it. That’s when I thought the safety fence was necessary as well. "We went walking almost every day. Even on days with heavy snow, we went to the park with no other people around, saying Let's go on an expedition to the Antarctic!" While seeking to develop a baby carriage, we found it had become more than our hobby. Tateyuki, did you have a hard time making Akiko’s vision a reality? Paying attention to my daily life, I noticed hints and ideas all around me. For example, when I saw a wine cart with beautiful gold wheels, I decided to use them for our baby carriage. We wanted to make a canopy with our favorite print, so I asked my friend who is involved in international trading to order Souleiado’s red fabric from France. "If we' re not careful, our babies will be surrounded by only plastic products. 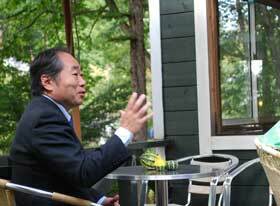 I believe it is sensibility, rather than 'easiness' or 'convenience', that leads people to happiness." We developed a prototype model after three or four years of trial and error. However, we had a lot of problems after that. One time it was flattened when a hyperactive baby jumped on it, showing us that it didn’t have enough strength. We kept on refining it. The baby is most important, after all. I was determined not to make it a folding model. Folding models contain hinges (for opening and closing) that present an unavoidable danger of catching babies’ fingers. We like to think about the convenience for adults who handle the baby carriages, but the priority is to provide a safe place where babies can be comfortable and happy. Why did you name it "LE POUSSE-POUSSE"? We found in a French dictionary that the word "POUSSE-POUSSE" means "baby carriage," and decided to use it as our product name because I has such an amusing ring to it. Why did you decide to commercially release the baby carriage you created? That’s because to　make our baby carriage lighter by using molded plastic outer wheels and cast aluminum rims, we needed a special mold that costs several million yen. We decided to go beyond the bounds of our hobby, and improved its quality to an acceptable level as a commercial product. Even after its release, we have made around a hundred improvements. Why did you choose the mail order as the basic sales system? I decided to sell it through the mail order from the beginning. We hope that people overseas as well will enjoy their lives with these improved modern baby carriages. "When we completed our first baby carriage, I thought, 'We finally did it!' I especially liked the new wheels, which were totally different from the previous ones made of weighty metal. Raising our babies has been one of the greatest experiences of our lives. I hope all parents have just as much fun! 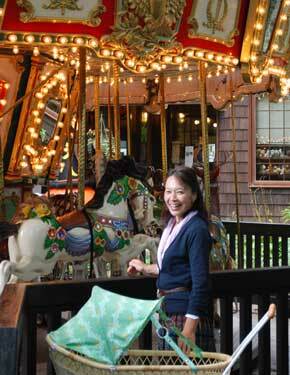 Akiko, do you have any messages to mothers who use your baby carriage? For me, my happiest moments are seeing other people enjoy what we have experienced, namely through our baby carriages. At first, our product didn’t sell very much. However, I was glad to hear that once customers use it, they quickly discover its excellence and like it very much. It sounds like raising children was a wonderful time for you. I really enjoyed myself. That period was a great time for us. Our sons seemed to have a great time, too. I heard that some of our customers’ children remember the carriage basket that was always with them when they were just babies. I feel that the figure of a baby in a carriage comes across as a very natural thing, and is something like a symbol of happiness. Your company also recycles baby carriages? The image of baby carriages being thrown out after just a few years, growing mold and being reduced to bulky garbage, is really a sad thought. From the beginning, I decided to adopt a trade-in system because I didn’t want to turn them into waste. We resell trade-in articles after thorough repair and cleaning. "We had more memorable moments raising our children thanks to our baby carriage... I hope that all parents have fun in the all-too-short period of raising their babies." It looks as if it could be used for interior decoration? That’s right, some of our customers decorate their rooms with the baby carriages, along with stuffed toys to cherish their memories Ideally we’d like for our baby carriages to be used generation after generation! Copyright(C) 2010 Tokyo Babycar Inc. All rights reserved.